Rain and a strong north wind greeted me as I set off at dusk on the Am Mam track to Camasunary, a lovely bay in the midst of the mountains on the south coast of Skye. I saw little in the darkness as I climbed to the broad pass then descended more steeply to the seashore. Just one set of bright lights – red, white and green – hung mysteriously in the air far away. Only when I reached the beach did I realise they must belong to a boat moored out in the bay. A few weaker lights marked tents pitched on the wind-rustled grasses just above the shore. 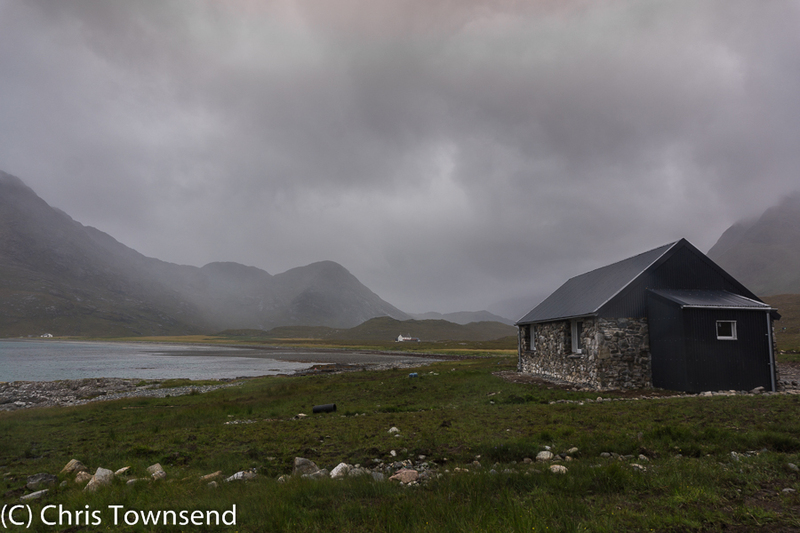 A cluster of them surrounded Camasunary bothy and there were lights inside. 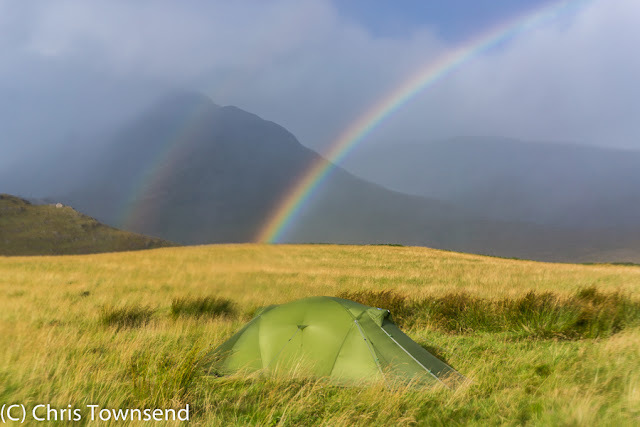 I found a pitch away from the others and wrestled against the wind to erect my tent, glad I’d brought a strong and stable, if heavy, geodesic dome that I knew would make less noise and shake less than lighter tents. The wind was not unexpected. Rain on nylon is just as noisy whatever tent you have though and heavy bursts woke me several times during the night. Dawn came grey and wet. The grasses bent and swayed outside the tent. 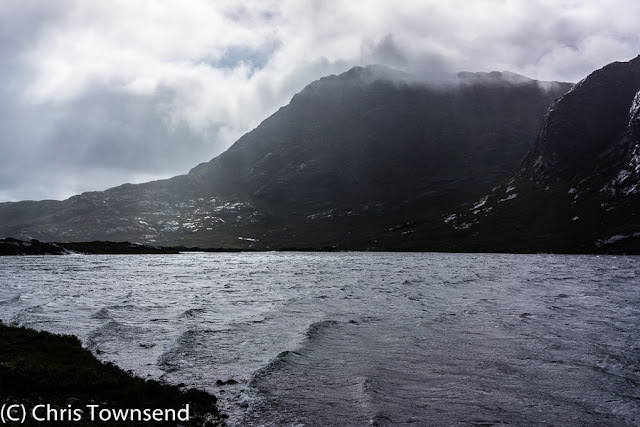 The sky was dark and heavy, the clouds sweeping over the summit of Sgurr na Stri, a rocky little 494 metre hill that rises steeply above Camasunary. The higher hills were hidden. Out of the tent I felt the full force of the cold north wind, stronger now than the night before. I checked the anemometer. Some gusts were over 30mph. That’s when it starts to have a noticeable effect on walking. Higher up the wind would be much stronger. No hills today unless the wind lessened. The new Camasunary bothy. The old one can be seen far left. The old white-washed bothy at the west end of the bay is one I’d stayed in many times in the past, though not for many years. Today it was occupied by a party who’d come in by sea, their kayaks pulled up on the grass above the beach. 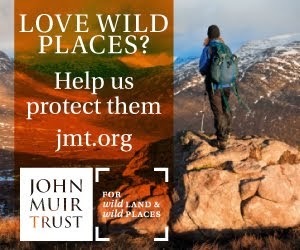 Although the surrounding area is owned by the John Muir Trust Camasunary itself isn’t and the owner wants the bothy for his private use. He didn’t want to deprive visitors of shelter though so he agreed that there should be a new bothy as a replacement and this was built in 2014 on the eastern side of the bay, about a kilometre from the old one. The approach to the new bothy is very boggy and the ground is marred by the deep ruts of vehicles. The stone-built, slate-roofed bothy looks a bit barn-like from the back as there are no windows on that side. Although complete it’s locked at present. Looking through the windows, which face the bay and will give a good view, it looked rather bare inside though I could see wooden bunks against the far wall. Like the old one the bothy will be maintained by the Mountain Bothies Association. I expect it’ll take a while for it to develop a character of it’s own. 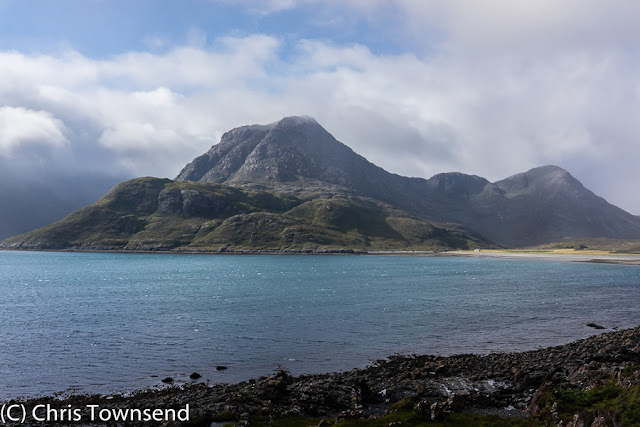 I wandered further along the south shore of Loch Scavaig on the rough and sometimes steep path that leads to the village of Elgol, where I would be in two days’ time, though not by foot. Ravens called overhead and down on the rocky shore oystercatchers piped shrilly and gulls and hooded crows scavenged amongst the debris, too much of which is plastic rubbish washed in from the sea. Back at the tent I sheltered inside and had hot soup for lunch. Outside the wind and rain hammered on. Turning away from the sea I headed into the wind and up the glen to Loch Creitheach. Wind-driven waves crashed on the shore. High above patches of blue appeared as the clouds finally tore apart. 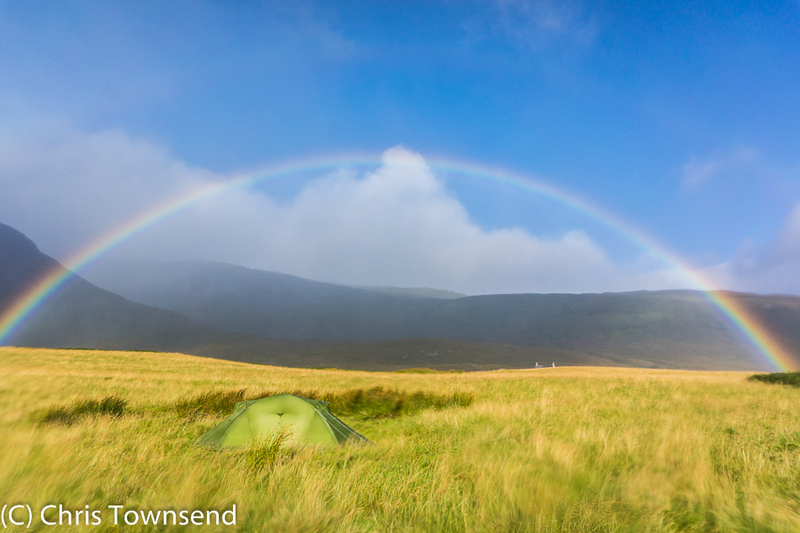 Rainbows were appearing as I returned to camp again. The rain continued to lash down. Combined with the wind this made photography difficult. Holding the camera steady was almost impossible even when lying or kneeling and keeping rain off the lens for long was completely impossible. Pictures were grabbed hastily. The wind and rain were still beating down when I fell asleep that night but morning came with quiet and just light drizzle. 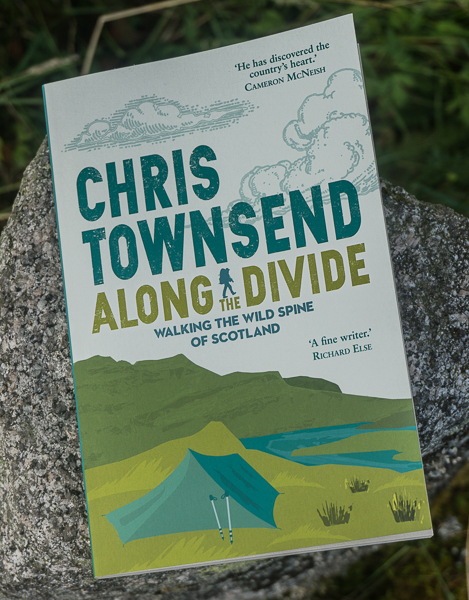 The latter died away as I was packing up and the midges appeared, clouds of them rising out of the grass and enveloping me. Where was that wind now? Quickly shoving everything into the pack I set off briskly back up the Am Mam track, soon leaving the midges behind. 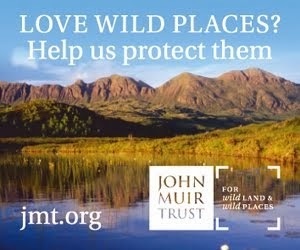 That evening I was in a meeting in Broadford with people from the John Muir Trust, this being the annual Trustees visit to a Trust property to see what’s happening on the ground and meet staff. 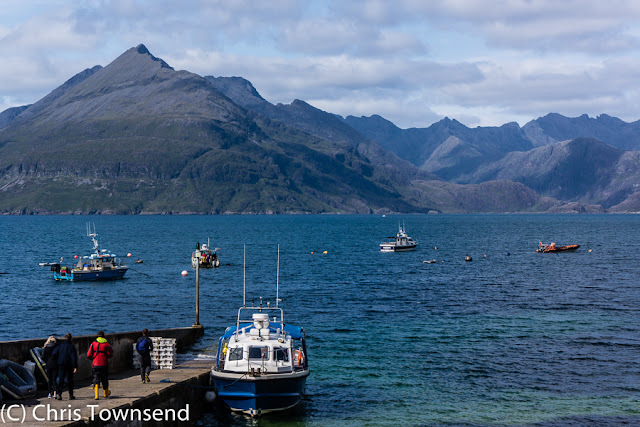 The following morning dawned bright and sunny and we were off to Elgol for a meeting in the village hall, with just time to go down to the harbour for the classic and spectacular view of the Cuillin beforehand. In the afternoon we escaped the indoors and visited Strathaird, one of the three adjoining estates the Trust owns on Skye. 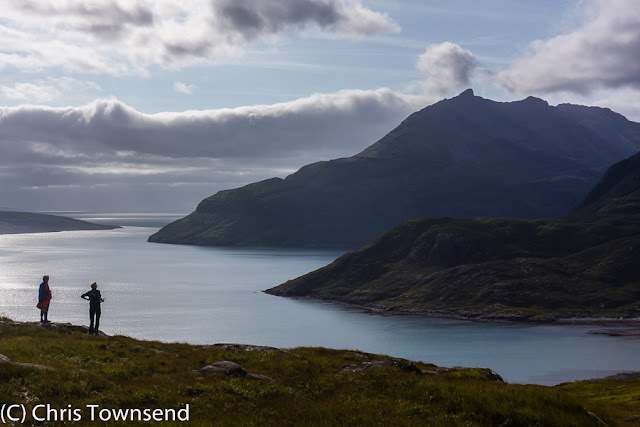 After looking round the lower farmland we took the Am Mam path that I’d now walked twice in the rain up to the pass and a wonderful view down to Camasunary and across to the Cuillin. If only it had been like this the previous two days! Returning to the road we were stopped by a magnificent sight. High above a golden eagle was circling with two ravens mobbing it. Just how big these eagles are was shown by the ravens, which looked small by comparison. The eagle seemed undisturbed by the two black would-be persecutors and just glided round in circles ignoring them. Eventually the ravens decided they’d had enough and flew off, as did the eagle shortly afterwards, heading towards Camasunary. Another eagle appeared in the distance but soon vanished. Golden eagles. A fine way to end a day on Skye.